« The Ames Apple: does anyone grow it? Vietnamese Apple – what kind of fruit is this? I send you a picture of our small Vietnamese apple. You see the coin they put next to them to show the size of the fruits. It has only one seed. Literally translated from Vietnamese, its name means apple, but it is not an apple but another type of fruit? Can anyone tell me what kind of fruit it is and why it is called an ‘apple’? 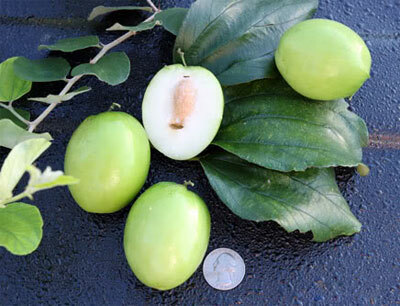 We received a comment from a visitor who believes that it looks like a variety of Jubjube. In the great work Fruits of Warm Climates, the author Julia Morton writes that ‘the Indian Jujube (Ziziphus jujuba) is of ancient culture in China and is widely grown in mild-temperate, rather dry areas.’ She goes on to give the many names that it has acquired in different countries and different languages. For example, in the Philippines it is known as manzana, or mazanita (apple or little apple) and in Vietnam, toa or tao nhuc, which the post tells us translates as ‘apple’. Julia Clements also informs us that when slightly unripe the taste is ‘much like that of a crab apple’. ….. At first the aroma is apple-like and pleasant but it becomes peculiarly musky as the fruit ages.’ There possibly lies the reason why it is called an ‘apple’. This fruit is named the ‘Apple ber’. ….a Thai variety. Google Apple ber and you will get more information.